I remember when Down Syndrome used to be considered a disorder or a defect. "Down syndrome is a chromosomal disorder that includes a combination of birth defects." 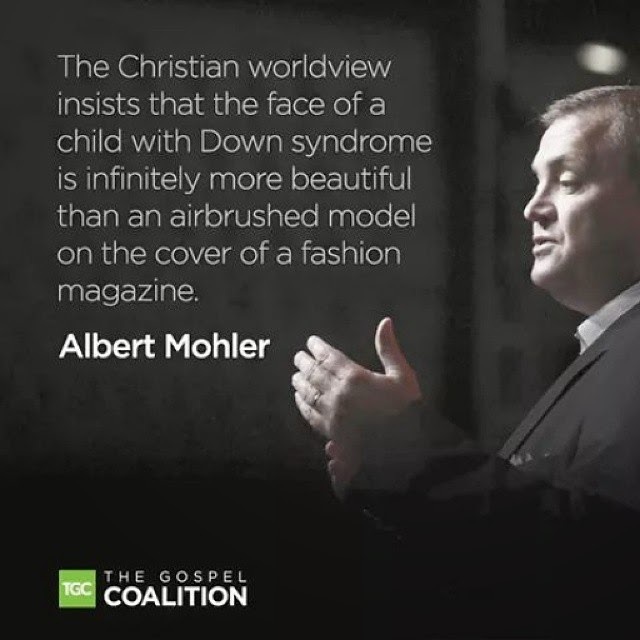 But recently, to my great surprise, two very trusted Anglican priest friends each posted this meme with an Albert Mohler quote, which paints Down Syndrome as something that makes one infinitely more beautiful than other people. It is in fact (according to Mohler's logic) something of a superpower. I'm not sure that I trust a Southern Baptist to define or delineate the Christian worldview for me. But this quote is wrongheaded any way you look at it. Can any one person be "infinitely more beautiful" than another human being, when we are all made in the image of God? Mohler robs cover models of the Imago Dei. "But," someone will object, "surely he is focusing on the airbrushing, and not the model." Doubtful. But let us yield, for sake of argument, that airbrushing blurs or mars the image of God in us. Do not aging, incapacity, defect, and disability mar it also? The God whose right arm is not shortened cannot be perfectly modeled by a man whose birth defect is to have no arms. The God who sees all cannot be perfectly reflected by a blind man. But just as these defects do not take away the image of God from the disabled, so airbrushing away of wrinkles does not take away the image of God from a cover model. Or, it ought not. It apparently does for Mohler. How else to explain the fact that another human being is "infinitely more beautiful" than she is? It's a funny thing about blindness. When Jesus confronted it, he healed it. He did not stop, upon seeing a blind man, and say: "Behold, a blind man! His face is infinitely more beautiful than the faces of the sighted." No. He saw a defect, and he fixed it. He healed it. He remedied it. He undid it and reversed it, like the effect of the Fall that it really is. Would Jesus heal the defect (only quoting from the March of Dimes, mind you!) we call Down Syndrome? I say he would. Moher must say no, because to do so would be to rob that individual of infinite beauty! In sharp contrast to the spirit of Mohler's quote, I was always taught that the Christian worldview demands that we "love the unlovely." And now that Mohler has informed me that airbrushed cover models are the unloveliest people of all ... I intend to dedicate the remnant of my life to loving them.